So nice that Emily Elf has brought Santa’s Birthday Gift to Addie. I especially like his letter! This entry was posted in Children's Picturebook, Christmas, CureJM, Uncategorized and tagged Christmas, Kneeling Santa on November 30, 2013 by Sherrill S. Cannon. Thank you for this comment, Donna… This means more to me than I can say…This is what it’s all about!!! This entry was posted in Children's Picturebook on November 30, 2013 by Sherrill S. Cannon. “Santa’s Birthday Gift”…What Santa gives, not gets! But the birth of Jesus is something we are all thankful for also, and it makes Thanksgiving even more special to anticipate what is coming next! This entry was posted in Children's Picturebook, Christmas, Uncategorized and tagged Christmas, Kneeling Santa on November 26, 2013 by Sherrill S. Cannon. Thanks Cassandra, for being such a wonderful role-model for your niece, but also for setting such a outstanding example of what a teenager can accomplish, even suffering with Juvenile Myositis and Juvenile Arthritis… She has such a positive outlook on life! She is also quite a talented dancer in spite of her arthritis, and her group’s presentation at the school football game was awesome! 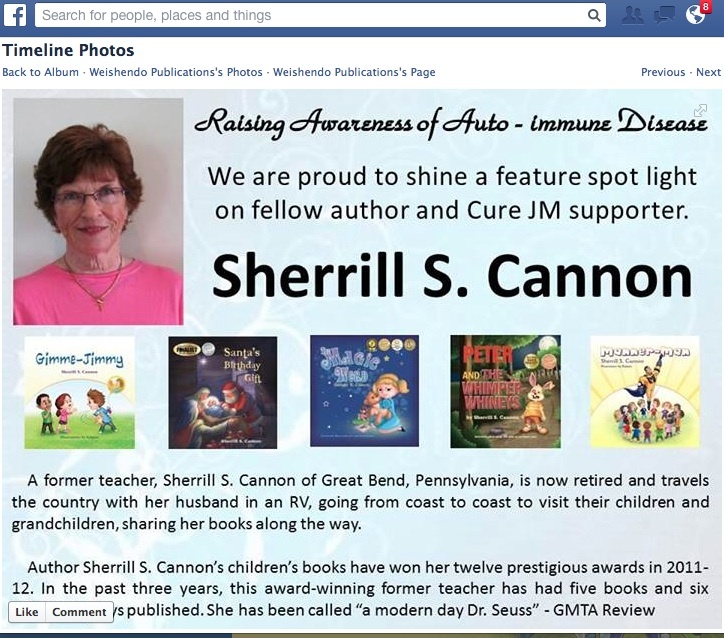 This entry was posted in CureJM, Uncategorized and tagged CureJM on November 25, 2013 by Sherrill S. Cannon. Ashlyn gives the Manner-Man salute! This entry was posted in Children's Picturebook, Manners, Superhero, Uncategorized, Whining on November 24, 2013 by Sherrill S. Cannon. The Alphabet Trip is now available on Lazy Bee Scripts! This is a play for the very young (kindergarteners and/or first graders) and each child has at least one line. There are suggested songs to go with the performance as well. My six other children’s plays are available on the site as well – all for elementary school student productions… Enjoy!!! This entry was posted in Plays, Uncategorized and tagged Elementary school plays, Lazy Bee Scripts on November 22, 2013 by Sherrill S. Cannon. Thanks to Burly Man and Weishendo Productions for this awesome Honor!